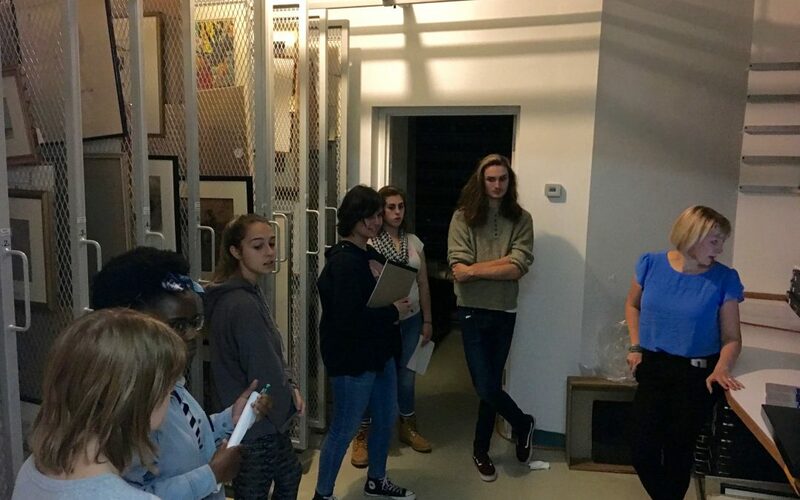 Senior Curator Dr. Francine Weiss showing the MuSE students objects in 3D Storage. 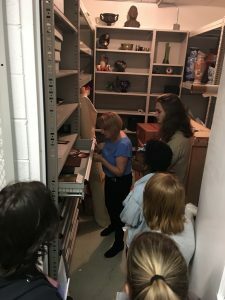 The students explored collection storage with Dr. Weiss, saw a demonstration of MIMSY, the collection database, and peeked in some of the drawers and files she opened as she found the pieces for the show the students had just seen. The students were brought into her story and her passion for the job. This is the behind the scenes access the MuSE students will have throughout their program. Each student was also assigned a piece from the collection to research and as their final project, they will create an interpretive response in any medium to their given artwork. The completed projects will go on display in the museum’s EdSpace in the Griswold house.